Digital Display Technologies Scare Up Success In “Ghostbusters” Museum Exhibit. Four 32-inch NEC V323-2, seven 42-inch NEC V423, one 46-inch NEC V463, and one NEC NP-P502H projector were installed in this exhibition. Madame Tussauds, the New York offshoot of the original museum in London, is a popular Times Square attraction. Traditionally known as a wax museum featuring hyper-lifelike statues of celebrities, musicians, sports stars and historic figures, the attraction now is turning its attention to exhibits that wholly immerse visitors in a new world—and that means incorporating technology. In late 2015, for its upcoming “Ghostbusters” exhibit, the museum tapped OpenEye Global, a digital experience design agency that it had used in the past for a variety of technical projects. “For Madame Tussauds, it was all about moving from wax statues to more of a theatrical experience that would resonate with visitors, something that told a story and brought the movie to life,” said Bryan Meszaros, CEO and founder of OpenEye Global. “Our responsibility was to help them find the right technology to accomplish that goal.” After reviewing a theme book developed by MXW Studios, a creative consultancy in the United Kingdom, OpenEye Global began parsing out the different technologies it could incorporate to bring the creative ideas to life while accommodating the museum’s requirements. “For us, it was all about what we could use to create the most authentic experience that was also cost-effective and fit into the budget,” said Eric Fluet, head of marketing and sales for Merlin Entertainments, the museum’s parent company. Using MXW’s designs, OpenEye Global created all the motion graphics and visuals in the exhibit and worked with Sony Pictures to ensure animations were true to the movie, including filming costumed actors in front of green screens to recreate movie characters. Czinkota Studios built the physical exhibit. As visitors continue past an animated video of a ghost on the subway wall, they come face-to-face with a replica of a subway car. The windows of the subway car are actually three 42-inch NEC displays showing an animation of an unhappy phantom named Sparky, a deranged prisoner executed by electrocution. 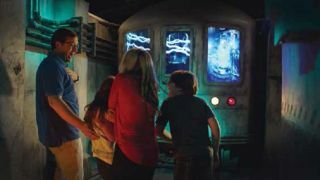 The animation moves across the three displays, appearing and disappearing as Sparky menaces visitors and giving the effect that he is pacing around the subway car. Meszaros said that an important feature of the displays made the animations much more believable: the ability to calibrate depth and color balance. Next, visitors arrive in the hallway of a haunted mansion, where several portraits hang on the walls. At first, everything seems normal—until the exhibit-goers realize that the portraits’ eyes are following them as they move down the hall. The portraits are actually Madame Tussauds employees shot to look like old paintings, shown on four 32-inch and four 42-inch NEC displays. The hallway ends at a portrait of Gertrude, who appears human until she morphs into her supernatural form and spits “ectoplasm” on passersby—water that comes from a jet above the portrait, triggered by a motion sensor. “There are gags that are not digital, such as cold air blasts coming out of walls, transparent cement lit from behind that appears to glow, rocking chairs that move on their own, smoke, music—it’s coming at you from all angles,” Meszaros said. Visitors proceed to the Ghostbusters’ headquarters, which features wax figures of the characters working on ghost containment technologies in their lab. Guests can marvel at the holographic ghosts captured in a containment box before they encounter the green blob-like apparition Slimer, created using the “Pepper’s Ghost” technique, in which an image is reflected off plexiglass at an angle.